Stems compact, ascending, stout, 5--10 mm diam. ; scales uniformly reddish brown, linear-subulate, 0.1--0.3 mm wide, thin, margins sinuous, nearly entire. 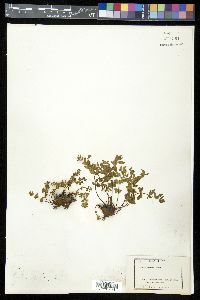 Leaves monomorphic, clustered on stem, 2.5--20 cm; croziers sparsely villous. Petiole brown, lustrous, rounded adaxially, with prominent articulation lines near base. Blade linear-oblong, pinnate-pinnatifid proximally, 1--4 cm wide; rachis brown proximally, green distally, straight, rounded adaxially, glabrous to sparsely villous. Pinnae ascending or perpendicular to rachis, decurrent on rachis, deeply 2-lobed (mitten-shaped) near base of leaf; costae absent. 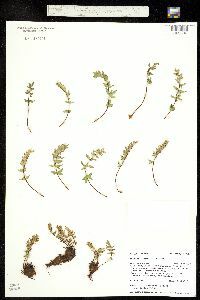 Ultimate segments lanceolate-deltate, 5--25 mm, herbaceous, glabrous; margins recurved on fertile segments, covering less than 1/2 abaxial surface, borders whitish, erose-denticulate; apex obtuse or rounded. Veins of ultimate segments evident. Sporangia sessile or subsessile, containing 64 spores, not intermixed with farina-producing glands. 2 n = 58. Sporulating summer--fall. Cliffs and rocky slopes, on a variety of substrates including granite and limestone; 1600--3800 m; Calif., Colo., Idaho, Mont., Nev., Oreg., Utah, Wash., Wyo. 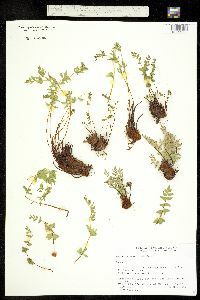 Pellaea breweri is distinguished from other North American taxa (except for some populations of P . glabella ) by the presence of prominent articulation lines near the base of the petiole. 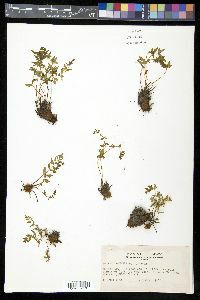 The leaves are easily detached, and many herbarium specimens consist of separate leaves and stems, the latter covered with petiole bases of approximately equal length.